Within these walls, we believe in the power of the smile, and think positivity is contagious so we give it freely. Our mission is to provide you with the best, most fun workout experience that you ve ever had, everytime you walk through our door. No gimmicks. No diets. No product pushing. We don t care what you look like, how old you are, or what you think you cant do. Dont just workout. Be ENTERTRAINED. We will completely change the way that you workout forever and were not just saying that, come see for yourself! I want my FREE TRIAL! 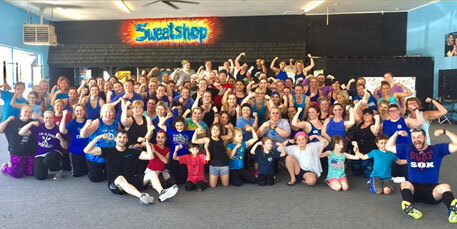 With 2 location in Buffalo Grove and Libertyville/ Grayslake, The Sweatshop exsists to provide you with the most fun and effective workout experience that you've ever had. Copyright © 2018. The Sweatshop LLC | All Rights Reserved.